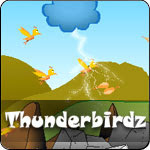 A FAB Thunderbirds International Rescue Flash online game featuring The Mole. Make your way through 90 levels and 5 unique game modes, frying tons of different species of enemies. Pick-up interesting upgrades and witness unique landscape events that will influence your success, in an action packed, fast-paced game where shooting in a straight line is a thing of the past. Use the Fun Builder to construct your very own challenges, and thanks to the integrated Game Randomizer, enjoy excellent re-playablity! Welcome to the world of Thunderbirdz.